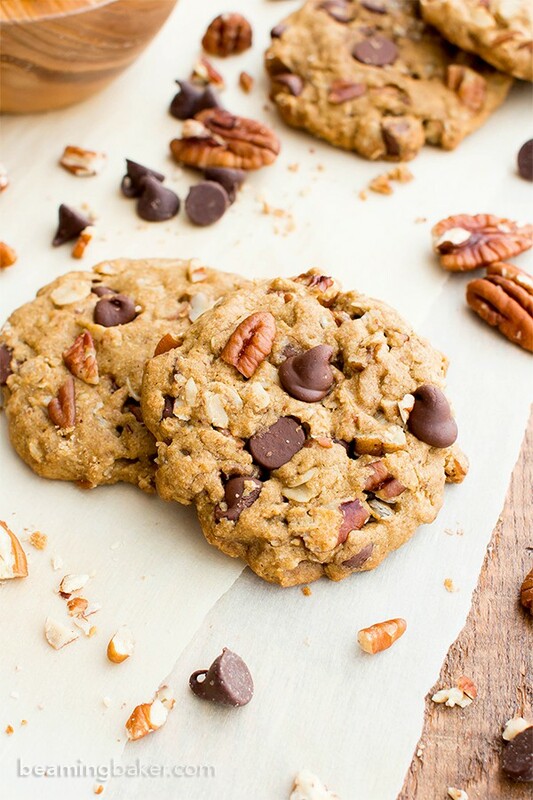 Maple Pecan Chocolate Chip Cookies (V, GF, DF): an easy recipe for deliciously soft and chewy oat flour chocolate chip cookies bursting with maple and pecans. Vegan, Gluten Free, Dairy Free, Whole Grain. 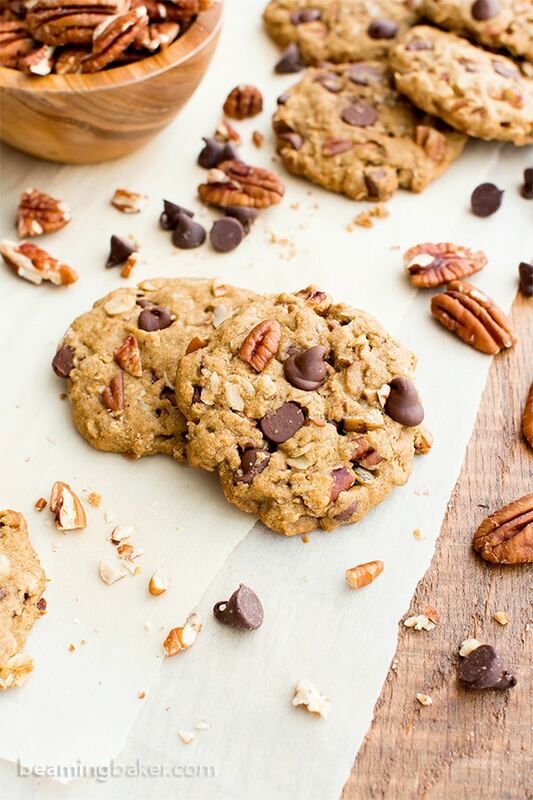 If you’re scrambling for a last minute gift, look no further than these seriously amazing Maple Pecan Chocolate Chip Cookies. 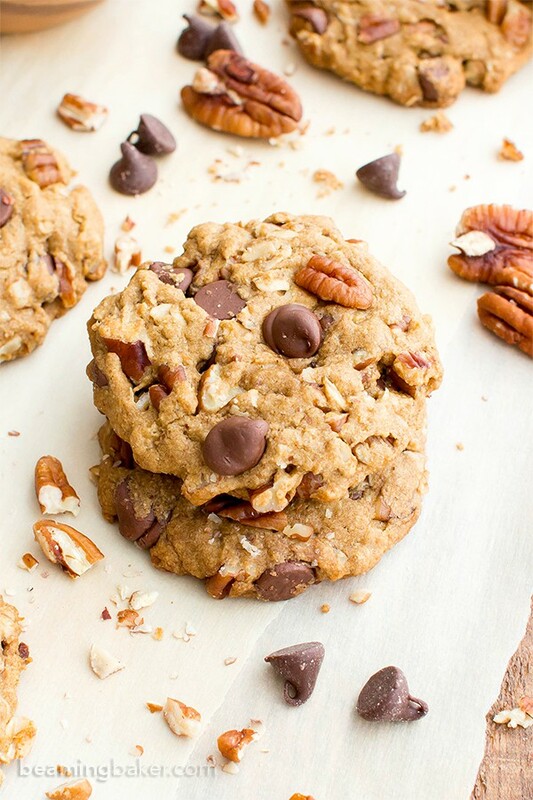 Maple, pecans, chocolate chips, oat flour—where could you go wrong? Or or, you could just make these for yourself and go ahead and dust off that charming Christmas collectible your former boss gave to you two years back and gift it to your semi-acquaintance coworker who you somehow got roped into getting a gift for no good reason. Just sayin’. It’s called upcycling. Yes, that sounds much better than regifting. 😉 At my house, Erik and I are kinda scrambling around to find that perfect last gift for my mom and my sister Jenny. We’ve already sent out sweet treat packages to Monica and Penny, who are spending the holidays with their gentlemen. Doesn’t that sound fancy? ???? As is the case every year, Erik’s gonna be my Chief Sous Chef or Head Candyman or something waaaay less creepy sounding. The two of us are gonna clear off every available space in the house, crack our knuckles (100% required for serious candy-making), slap on some festive hairnets (keepin’ it clean, folks! ), pop on our fave Christmas tunes (a mix of instrumentals, pop songs and some dramatic opera just cuz), then get down to business! Let’s just say that the two of us have become true experts in buying everything in bulk. Plus, we have “cleverly” repurposed two bookshelves for, wouldn’t ya know it, holding gigantor bags of pecans, almond meal and oat flour. I mean, it’s not like they were holding books, or anything… Ahem. We’re also gonna be setting up our annual gift-wrapping station, with all the ribbons, multi-colored tissue paper, cookie tins and handwritten gift tags (which I especially fear because my handwriting is unbelievably wretched). One year, I just wrote initials and it saved me like 3 whole hours. Yes, 3 whole hours. I’m pretty sure kindergarteners write faster than me. And I only have a slight advantage on them from, ya know, like 3 decades of practice. Another year, I had Erik wrap the gifts. That was a… colorful experience. Everyone kept complimenting us on letting our kid do the wrapping (um, no kids here, folks). I’d simply nod and say… well, I’d say nothing at all, then pretend I heard my phone ringing in the distance and swiftly dart away. So, between my below kindergarten-level handwriting and Erik’s child-like gift-wrapping, the two of us are a real treat! Any takers on our holiday help this year? Well then. I guess none of you will be receiving glowing compliments on allowing your “children” to wrap and scribble tags this year. Ahem. 😉 But we can offer our candy-making services! I promise they’re at least preschool-level proficiency. Not impressed? Darn it! J/k! I hope you love this recipe as much as my family does. 🙂 It’s one of our favorite cookies to date! I’m so happy to spend the holidays with you. What could be better than some quality kitchen time, whipping up fantastic treats for the ones we love, together? Wishing you and your family a loving, laughter-filled season, just bursting with kindness and fun. What’s the most thoughtful gift you’ve ever given? 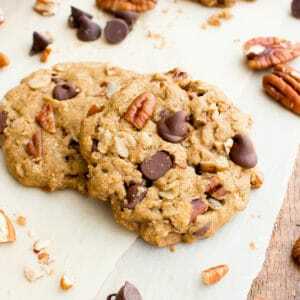 Maple Pecan Chocolate Chip Cookies (V, GF, DF): an easy recipe for deliciously soft and chewy oat flour chocolate chip cookies bursting with maple and pecans. Vegan, Gluten Free, Dairy-Free, Oat Flour. In a medium bowl, whisk together all the dry ingredients: oat flour, oats, baking soda, baking powder and salt. In a large bowl, whisk together all the wet ingredients: coconut oil, coconut sugar, maple syrup, flax eggs, and vanilla. Whisk until thoroughly combined. Add the dry ingredients to the wet ingredients. Whisk until you get a sticky and thoroughly combined ball of soft dough. 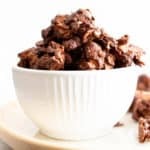 Fold in pecans and chocolate chips. Scoop 2 tablespoons of cookie dough onto the prepared baking sheet. Using a fork, flatten cookies into a round disc—they will not spread during baking. 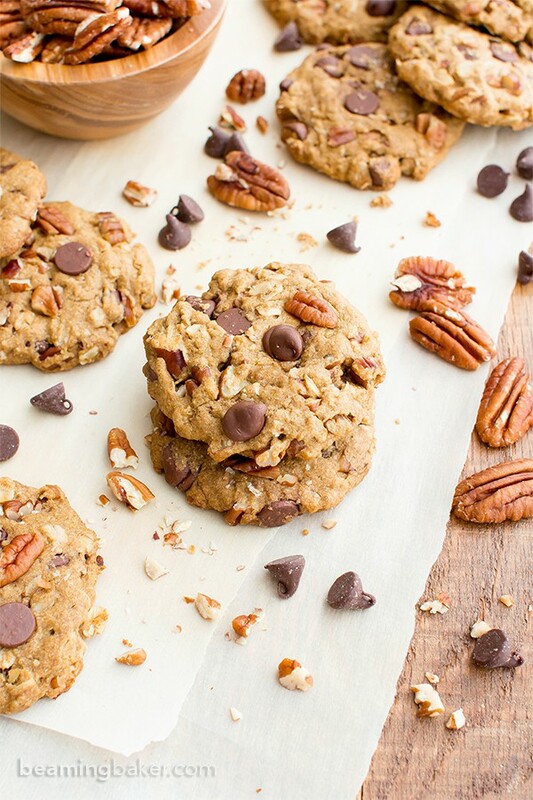 Press pecans and chocolate chips into the tops of the cookies. Bake for 8-12 minutes. Using a flat, heatproof spatula, lift cookies off the baking sheet and transfer to a cooling rack. Allow to cool completely. Enjoy! Storing instructions below. 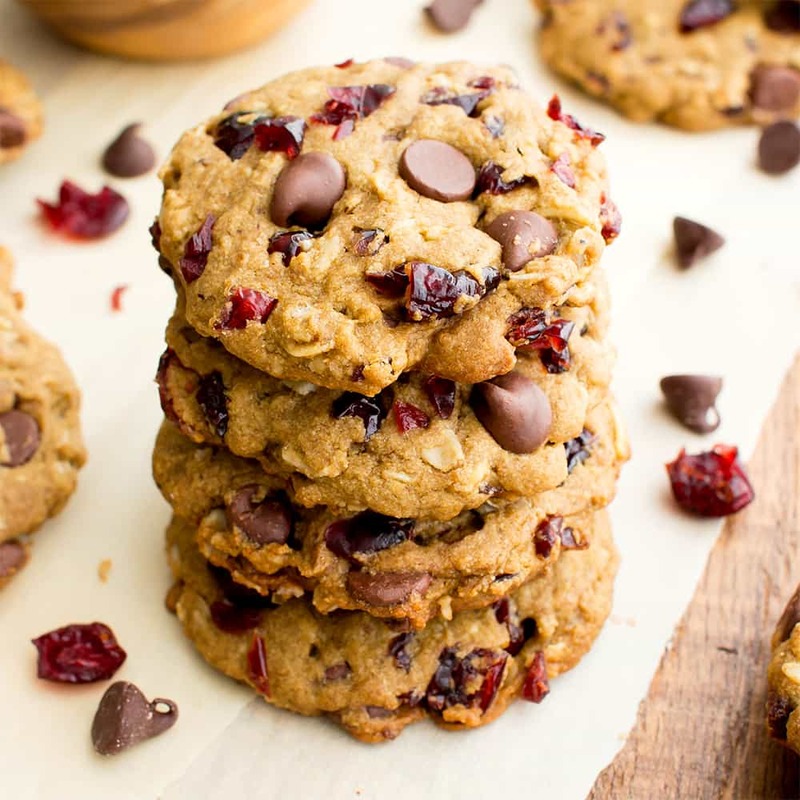 - Adapted from my Vegan Cranberry Chocolate Chip Cookies and my Triple Chocolate Peppermint Cookies. - *You can skip this step, but the dough is more likely to be too sticky to flatten with a fork. Also, the cookies are less likely to have a beautiful texture. - These cookies freeze well. Store in an airtight, freezer-friendly container for 1 month. 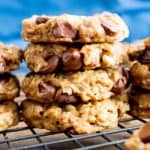 - More cookie recipes: double chocolate chip cookies, cranberry chocolate chip, peanut butter chocolate chip oatmeal. 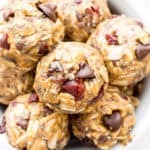 - Holiday gift recipe ideas: chocolate coconut truffles, almond butter fudge cups, no bake peanut butter bars, cookie dough truffles. I’m making exact same treat making plan myself. 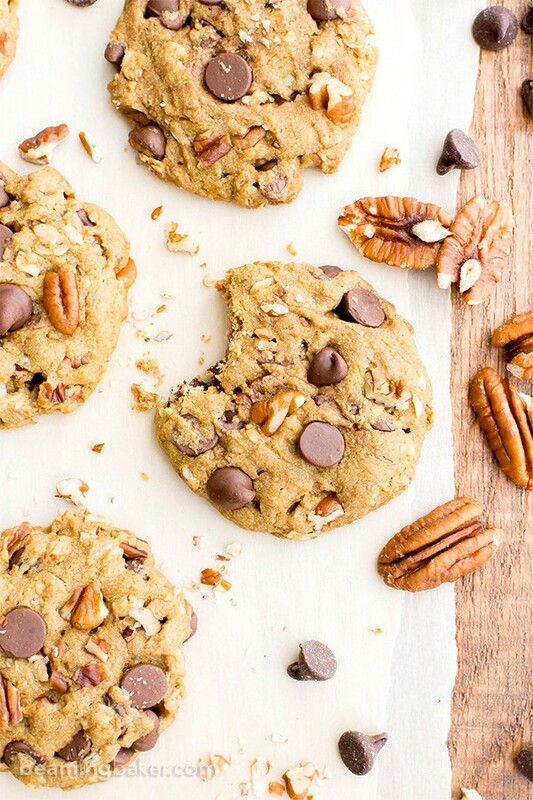 I’m trying to convert all my family and friends to healthy eating so this year they all gonna get healthy treats 🙂 And same as you with chocolate and pecans, I purchased ALL coconut oil in the store LOL haha These cookies looks absolutely delicious Demeter (I wish I have one or two now with my tea ;)) Pecans and chocolate are match made in heaven, right?! I love how healthy and nutritious these cookies are. Just perfect! That’s awesome, Natalie! Your family and friends are so lucky that they get to enjoy all of your healthy and delicious treats. 🙂 May I be added to that list? 😉 Lolol on your coconut oil purchase. Perhaps I can share my bookcase with you? Hehe. Thanks so much my friend! 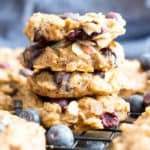 Oat flour can be made with a blender right? These look amazing! 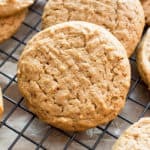 I LOVE making oat flour cookies – so much wonderful chewiness! 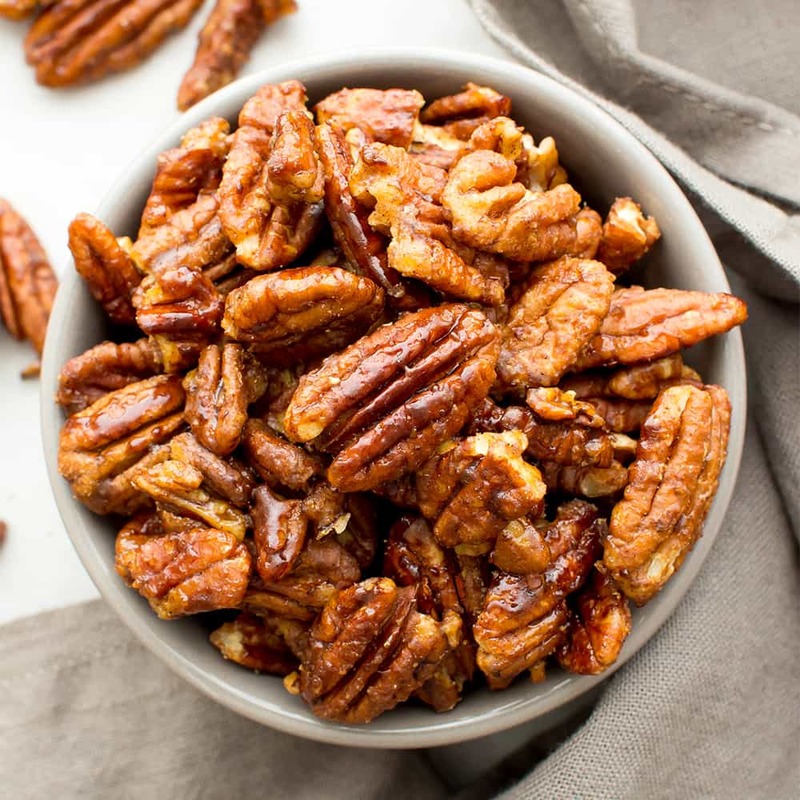 I love your addition of the pecans and maple flavor, sounds so yummy and perfect for the holidays. I can totally relate to your gift-wrapping woes – I am the WORST when it comes to wrapping. Thinking about resorting to using bags and tissue paper rather than traditional paper for every gift, haha! Right?? Else they’re just gathering dust and other junk that have now attempted to take over that space. 😉 The pantry feels like it gets smaller every day. What’s it’s problem, anyway? Oh seriously!! Packages are the worst! There’s added pressure due to the fact that things could go terribly awry if you’re handwriting is misinterpreted. Lol. I must now consider this mystical unlabeled box you mentioned. It has a certain mystique to it that I like. As well as lack of having to do more things. Haha. 😉 Muah! Upcycling…I love it! Much better term that regifting! 🙂 I’m still in awe that Christmas is less than a week away, but I’m ready! My shopping is finished and my husband and I finished wrapping last night…WHEW! 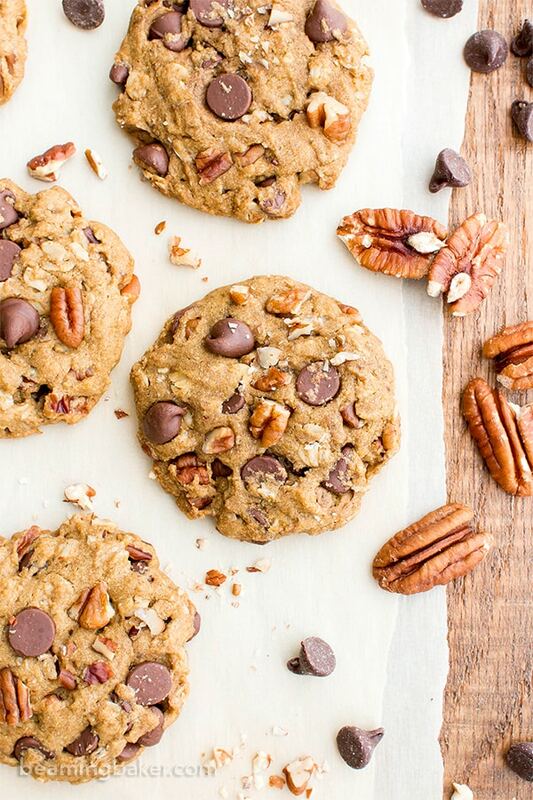 Now onto these cookies…I’ll take these ALL, please! I don’t need to share them, no no no…I’ll just eat them all myself. 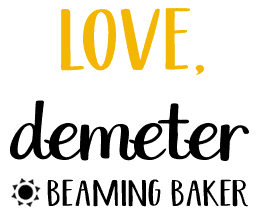 I love the pecan and chocolate chip flavor, Demeter! My kind of cookie. Pinned, of course! Hope you are having a wonderful week! Haha. I think so! 😉 Phew on you being ready! It’s got to be a HUGE relief. Hopefully you have time to relax as well. 🙂 Thank you for pinning! Have a fantastic week! Hi! Could we try this with honey? Even though the name is maple 🙂 lol if so do you suggest an amount? They look delish! Thank you! I tried the honey and a tiny bit of molasses and the cookies were flat 🙁 I wonder what happened 🙁 I used quick oats maybe that was the issue??? Still yummy… should I try again with regular oats then? Can I use regular eggs instead? Hi Gaby, yes that should work! 🙂 Enjoy! – Egg/Oeuf: yes, you can swap the flax eggs with regular chicken eggs. First of all, the cookies are delicious. I’m not sure what I did wrong but they don’t stay together very well. I followed the recipe exactly (used mini chocolate chips) but they are very crumbly. Despite that fact, we can’t stop eating them. Do you have any suggestions? Thanks for this taste treat! This is seriously the best cookie recipe!! 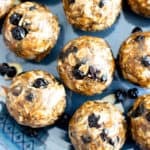 I absolutely loved it- I actually removed the sugar and added a tad of maple syrup instead and oh boy were they delicious. 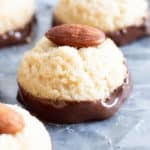 I will be making these as little balls for our holiday party! For those who found them a bit crumbly, maybe add some maple syrup or extra almond butter to hold it together. Cheers! At last! I have finally found a yummy cookie that follows my crazy restricted (food sensitivities) diet. 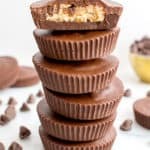 It’s been difficult to find gluten free, vegan, most nuts free (pecan seems to be the only one my gut can tolerate right now) recipes that satisfy sweet tooth and texture cravings. Woohoo!!! Kadee, I’m beyond pleased to hear this! 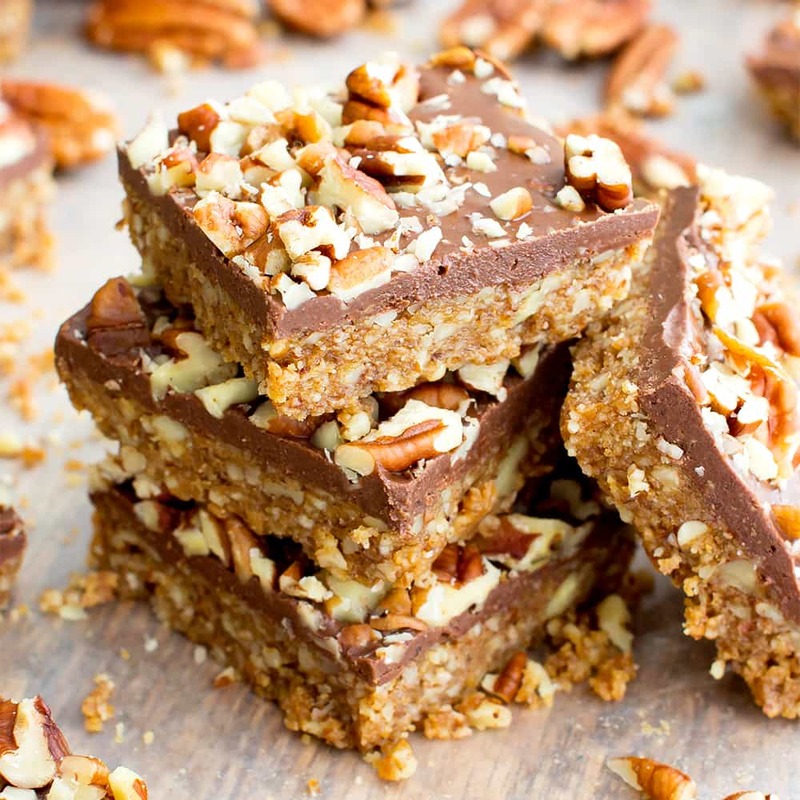 Any time you’re looking for a gluten free vegan treat, swing on over here! That’s my specialty. 🙂 Let me know if you ever need help finding a recipe. Happy baking! 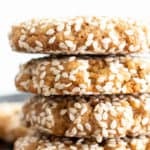 Your cookie recipes have been amazing for my daughter who has numerous food sensitivities. Unfortunately, we just found out that we have to add coconut to the list. 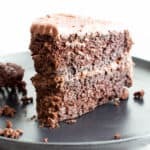 This recipe and the others on your site are her favorites. Do you know of any substitutes that work well in your recipes if I were to replace the coconut sugar and coconut oil? Thank you! Hi Paige! I’m so happy that your daughter is able to enjoy my recipes, and sorry to hear about the new sensitivity. You can try swapping the coconut sugar for organic brown sugar. As for the oil, I’ve had readers use avocado oil or a neutral tasting oil with good results in my baked recipes. Hope this helps!